SE Sciences maintains an in-house feasibility laboratory performing proof of concept studies, microbial microcosm evaluations, soil oxidant demand and oxidant efficacy testing, reductant efficacy testing, heavy metal stabilization and fixation, and much more. Our lab services can provide the data and validation required to design effective, cost beneficial full-scale applications. This relatively inexpensive project investment can provide the groundwork from which the most optimum pathway to site closure can be achieved. SE Sciences laboratory staff routinely executes a broad range of procedures including gravimetric, volumetric, and instrumental analyses. 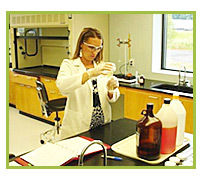 Our highly trained personnel are experienced in a variety of advanced scientific disciplines including organic chemistry, environmental chemistry, and environmental toxicology. SE Sciences believes in developing a systematic approach unique to the geochemical profile of each site and providing technology validation prior to a site wide implementation. It has been demonstrated that an initial feasibility evaluation will give clients much greater success in meeting project goals and project budgets.